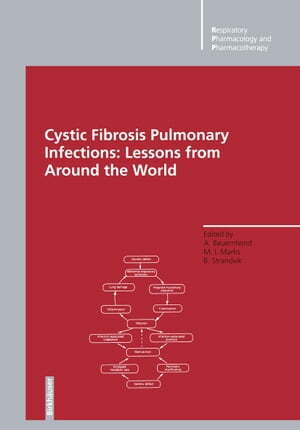 Collins Booksellers - Cystic Fibrosis Pulmonary Infections: Lessons from Around the World by Adolf Bauernfeind, Melvin I. Marks & Brigitta Strandvik, 9783034873598. Buy this book online. Infection of the lower respiratory tract is a major determinant of the course of cystic fibrosis. Although numerous efforts have been made to elucidate the specific mechanisms predisposing the respiratory mucosa of cystic fibrosis patients to infection, so far no clinically relevant procedures for completely effective prevention or control of infection have resulted. Hence, in dealing with infections in cystic fibrosis, we continue to rely mainly on antimicrobials. Antiinfective measures are inseparably correlated with microbiology, and the quality of antiinfec­ tive therapy directly reflects the quality of microbial monitoring. Vali­ dated guidelines for microbiologic testing and antiinfective use need to be developed and made available to all health providers and their cystic fibrosis patients. Several years ago, the editors cochaired a symposium at the Interna­ tional Congress of Chemotherapy on the Global Perspectives of Micro­ biological and Clinical Infectious Diseases in Patients with Cystic Fibrosis. During this half-day symposium, the editors heard reports from several countries around the world with an alarming range of survival for patients with cystic fibrosis. This sent a dramatic message to us that the understanding of this disease, its diagnosis, management and prevention was different in various countries and that patients may be inconsistently served. That is how our journey began.